Please note that the content of this book primarily consists of articles available from Wikipedia or other free sources online. Zomba is a city in southern Malawi, in the Shire Highlands. It is the administrative capital of Zomba District.It was the capital of first British Central Africa and then Nyasaland before the establishment of the Republic of Malawi in 1964. It was also the first capital of Malawi and remained its capital until 1974, when Lilongwe became the capital. The city is best known for its British colonial architecture and its location at the base of the dramatic Zomba Plateau. 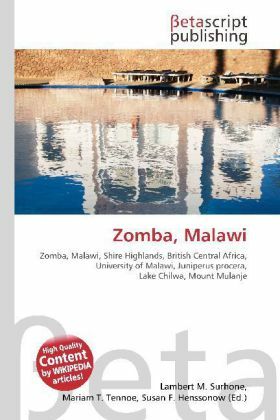 Zomba is also the home of Chancellor College of the University of Malawi.